Today we have Will Esgro with us from Happy Fun Time LIVE to discuss tabletop and boardgame streaming. This topic was very interesting and I appreciated Will taking the time to share his expertise. 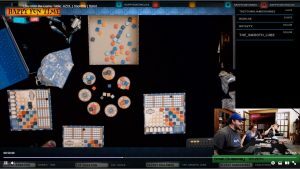 Tabletop streaming is growing in popularity and I was excited to learn what it takes to setup and run a stream, as well as what drives people to watch streamed boardgames. Kyle: Welcome Will! Before we get started how about you introduce yourself and Happy Fun Time LIVE. Will: My name is Will Esgro, I was born and raised in Northeastern Pennsylvania. My professional background was sales which later transferred into technology. A little over two years ago, my wife and I adopted our Son and I have been a stay at home dad since then. Happy Fun Time LIVE was born out of this transition as it gives me time to socialize with other adults (sometimes) and it gives me a creative outlet. The initial intent of the Twitch stream was to serve as a vehicle for my ultimate fantasy… designing and publishing my own games. It has since become more of the focus project rather than the vehicle and my design and publishing plans took a back seat. We have been streaming since September of last year. We made the affiliate level on Twitch within a month, which allows for a sort of monetization, and we’ve grown to almost 500 followers since that beginning.